The X-NUCLEO-53L0A1 expansion board features the VL53L0X ranging and gesture detection sensor, based on ST’s FlightSense™, Time-of-Flight technology. It is an evaluation board that provides an introduction to the ranging and gesture detection capabilities of the VL53L0X module.To allow the user to validate the VL53L0X in an environment as close as possible to its final application, the X-NUCLEO-53L0A1expansion board is delivered with a cover glass holder in which 3 different spacers of 0.25, 0.5 and 1mm height can be fitted below the cover glass in order to simulate various air gaps. Two VL53L0X satellites can be connected using the two 10 pin connectors.The expansion board is compatible with the STM32 Nucleo board family, and with the Arduino UNO R3 connector layout.Several ST expansion boards can be superposed through the Arduino connectors, which allows, for example, to develop VL53L0X applications with Bluetooth or Wi-Fi interface. VL53L0X ranging and gesture detection sensor module. Accurate absolute ranging distance, independent of the reflectance of the target. 4-digit display, displaying the distance of a target from the ranging sensor. Basic gesture recognition application can be developed with a VL53L0X module. 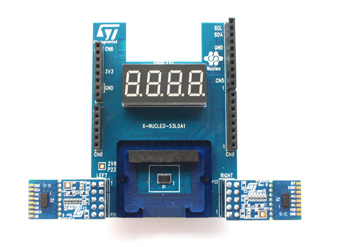 Compatible with STM32 Nucleo board family. Equipped with ArduinoTM UNO R3 connector. A cover glass to simulate the integration of the VL53L0X into the customer’s final product. Two VL53L0X satellites, which can be plugged onto the X-NUCLEO-53L0A1 expansion board or connected through flying wires to the X-NUCLEO-53L0A1 expansion board. Two 10 pin connectors to enable customer to connect the two satellites onto the X-NUCLEO-53L0A1 expansion board.